France made European history in the shadow of the Eiffel Tower on Thursday, when it pulverized a three-ton haul of ivory tusks and ornaments. The event, which was meant as a message to illegal wildlife traffickers, was held on the Champs de Mars in front of a crowd of policemen and photographers, says the Guardian. 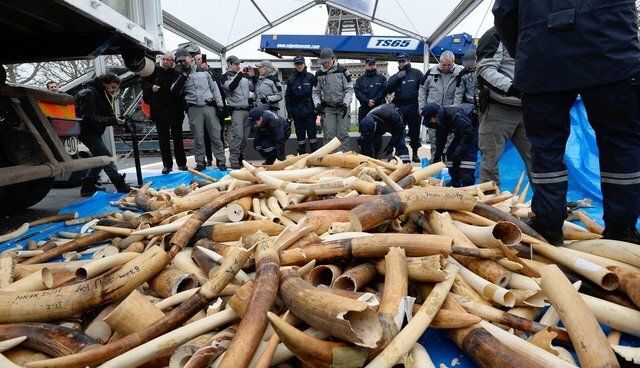 Most of the tusks, either whole or carved into batons of ivory, weighing 2,304 kg [5,079 pounds], had been seized by customs officers at Roissy and Orly airports either in freight cargo or from passengers. A further 15,357 pieces of ivory, including statues and jewellery, weighing 800 kg [1,764 pounds], were also fed into the grinder. Officials said the powder would be encased in a composite material to make it impossible to retrieve, and used in construction. "The destruction of illegal ivory has become indispensable in the fight against trafficking of threatened species," said Philippe Martin, the French minister for ecology, durable development and energy. "It's a firm message that we are sending to the dealers who are threatening the survival of the elephant in Africa." The rest of France's 14 tons of ivory will be destroyed in the coming months, officials say. Martin also noted that France has increased ivory fines by up to ten times recently. "The message to the poachers and traffickers is clear: the trafficking of ivory has no future; with this action we are telling them ivory has no value." "By destroying its ivory stockpile, France has joined a growing number of nations, including the US and China, that are taking a public stand against illegal ivory trafficking. We call on other countries to join this important trend of taking a strong public stance against the illegal wildlife trade."